Operated by a company called Athlete Interactive, the site has Williams-centric game stories, Williams-centric features and Williams-centric photo galleries. The site's editors shoehorn "Williams" or "D-Will" into roughly 90% of their headlines, which, to be fair, is sort of the point. The headline of one particularly exhaustive 1,850-word game story last week: "D-Will Stars as Nets Topple Knicks." "They do a great job of making sure it's personalized," Williams said. This isn't muckrake journalism-Williams and his representatives at Excel Sports Management get to vet everything that goes live on the site-but they feel it serves a purpose. Launched not long after the Jazz traded Williams to the Nets in 2011, it was originally conceived as a way to enhance his appeal to sponsors in a new market. Jaymee Messler, the senior vice president for marketing at Excel, described it as "creating a larger brand portfolio" for him. Athletes having a personal website to trumpet their accomplishments is nothing new, but Williams's site is rare in that it features content that is written like regular news stories, save for the fact that Williams is always the central figure. 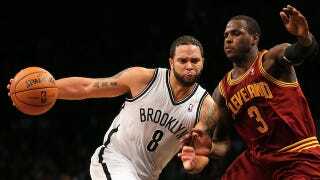 This story, about the Nets' recent victory over the New York Knicks is a perfect example. The story is startlingly long, and it features pro-Williams tweets interspersed throughout the piece, as well as every quote by Williams blockquoted in massive font. Once the lockout ended, and the Nets began to slog their way through their final season in Newark, the activity on DeronWilliams.com cooled by design. "We sort of stopped for a while," said David Neiman, the president of Athlete Interactive, "just because of the issues that they were having with regards to winning." "We make sure to cover wins and losses, the positive and negative, on Deron's web site (and on the sites of other clients we work with); DeronWilliams.com actually has pretty thorough news coverage of last season. In the Wall Street Journal article, I was speaking specifically about Deron's blog, which we had been maintaining with him fairly actively during his time in Turkey, but which we stopped working on during much of last year while the Nets were struggling. While on the one hand, it would be interesting to hear an athlete's thoughts when times are tough, it's also understandable that an athlete might find the idea of blogging self-indulgent, distracting and/or inappropriate when their team isn't winning. That was essentially the situation I was referring to."